Welcome to WallCloudChaser.com, home of storm chaser Jarrod Schoenecker from Minnesota. Twin Cities Meteorological Society: What's All the Fuss About?! I really want to spread the word about Twin Cities Meteorological Society (TCMetSoc). Some of you may or may not know of my involvement in this organization. I will give you a quick synopsis. 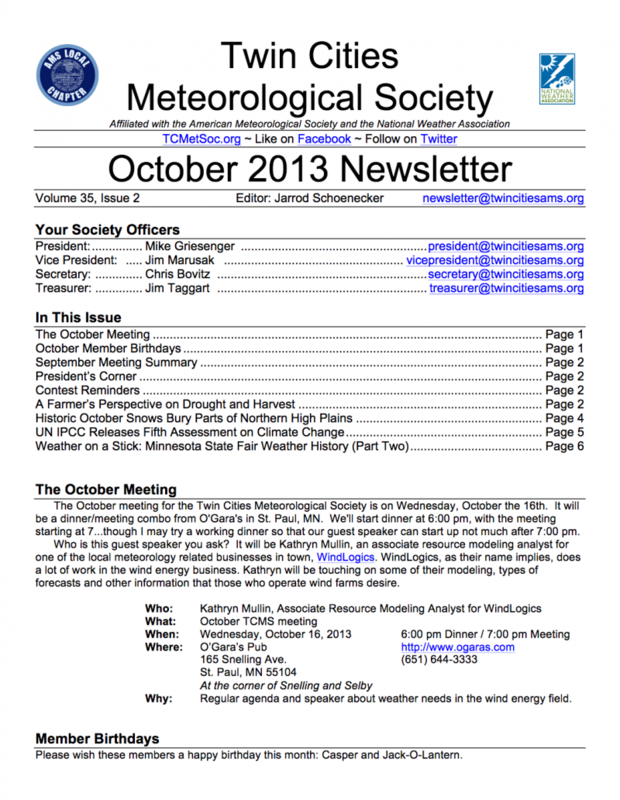 In the latter half of 2012, I came upon this organization, "Twin Cities Meteorological Society." It didn't seem very well publicized and maybe lacked a lot of glam in it's newsletter, but it was interesting enough for me to go to meeting. After all, I do love weather so what's not to love? One of my first questions before I even went was, "Is this for people who are NOT A METEOROLOGIST too!?" I really didn't know then. I still think people are intimidated by the name who don't hold the meteorologist title. Don't fear though! They will accept pretty much anyone interested in weather! You could be a storm chaser, a field scientist, a retired meteorologist, an industry meteorologist, a Skywarn spotter, CoCoRah reporter, or just share some general interest in weather. 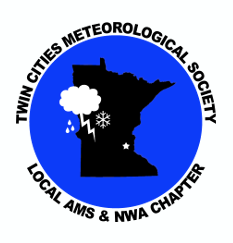 ﻿The new Twin Cities Meteorological Society Logo﻿. When taking over the newsletter, I couldn't help but notice a lack of style and character, a name for it, and, wait, no logo for the organization!?! Travesty! Then I became ambitious on getting a logo for the organization and a name for the newsletter. It just had to be done. I put out that we were looking for logo submissions to create the face of TCMetSoc. With only one other submission than my own, the membership voted on my logo with a few adjustments. Thus we had a visual of what TCMetSoc is. 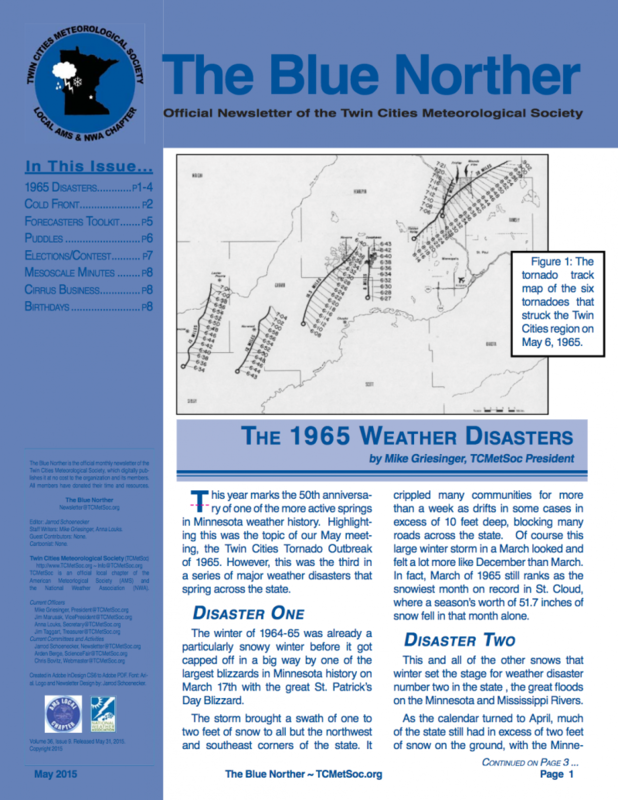 ABOVE: The old TCMetSoc newsletter. BELOW: The new TCMetSoc newsletter. What was next for me then? Well, secretary for a few years, which I will honestly say is a position better left to someone else whose time is not taken up by the newsletter. As well, for someone who is more dedicated to documenting the meeting and in a timely manner. This chapter year, 2017-2018, will be my first as Vice President. I think this is a more fitting role for me currently in our organization. I am still the newsletter editor as well. If I may, Chris Bovitz deserves a shout-out for his continued second set of eyes on the newsletter. He knows AP Syle probably much better than I do and has a good eye for catching errors. A great help. Although, I do have some styles of my own that apply to the newsletter that are not AP Syle, but that is for the writing nerds. This brings us to present day. ...yet that is not all. Under the new leadership of Daniel Dix last year, we explored new options of making our "meetings" a fun event. So, instead of meetings, I am going to be calling our gatherings "events" from here on out, because that is what they are. They are social, fun, diverse, current and educational. We generally have eight meetings a year, with a break during December and from June through August. We host at a variety of locations, usually at or near our guest speaker's work or home. Our topics vary greatly and we do that purposefully. We try not to repeat the same or similar event within one year and try to vary from year to year. Most of our events also have a pre-social hour, as you may have noticed. Those of us who can, meet ahead of time at a pre-planned, publicized place for drinks and dinner if you like. It is truely a social hour and you will meet some new faces and get to talk to them if you haven't been to an event before or if you want to just catch up with old weather friends. Another new item that I believe we will keep on board for this year, final chapter meeting trivia for prizes! Members who have paid their dues can participate in fun weather trivia for a chance to win a small denomination gift card. A tradition that we have carried on that gives you a little bit of bragging right (or not) as well as a gift card for most of the winners, is our winter weather contest. Eligible members make submissions for different weather categories to see who will win in the spring. You have to be a paid member whose membership is paid through the end of the contest to win. What does it cost? Less than a gourmet meal and a drink! It is $20/year for a regular membership. Student memberships are available for $5/year. That's it. Most of all though, join us for one, get hooked, pay your dues and come to a few more throughout the year! Membership dues can be paid online through PayPal or in person at a meeting. We post all of our event notices on Facebook, Twitter and our Web page. Meeting notices and the newsletter are also sent out via membership e-mail. Won't you join us? Bring a friend! Follow TCMetSoc on Twitter HERE. Like TCMetSoc on Facebook HERE. Visit TCMetSoc Web Page HERE. What is a Skywarn Spotter: Starting. Being a Skywarn spotter is a great way to give something back to your greater community that doesn't require more effort than you are able to give. I became a Skywarn spotter about 15 years ago while attending college in the Fargo-Moorhead area. I knew little about it then. I had been hap-hazardly storm chasing at that point for about 5 years though. This was a good step up for me and something I should have done even earlier. 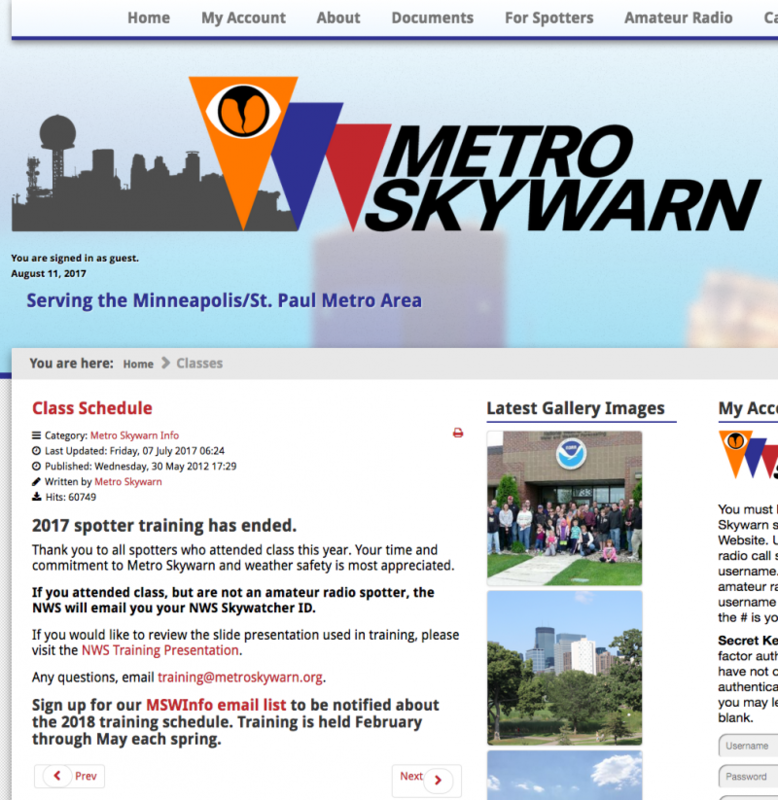 Now, I teach Skywarn classes for the National Weather Service in the Twin Cities, as needed, and I am on the board and am a lead trainer for Metro Skywarn. My storm chasing and skywarn spotting skills often meld but there are distinct differences in what is storm chasing and what is spotting. It should be noted that the information here stems from my experience alone and is not necessarily respresentative of Metro Skywarn, the National Weather Service or Twin Cities Meteorological Society. However, I believe this information to be correct to the best of my knowledge. Let's dig in. What is/does a Skywarn Spotter do? A skywarn spotter is a person that chooses to activate themselves in times of adverse weather to report critical weather information back to the National Weather Service. That is it in the simplest form. What is the impact of being a spotter? Reports from trained Skywarn spotters offer a multitude of help where the radar cannot see. It offers much more credibiity and confidence in a warning, both on the public level and in the warning process at the National Weather Service. Along the same lines, not receiving a report from a spotter can sometimes warrant a call to the spotter asking them what conditions look like. In this scenario, it can prevent a warning from being issued when it is not needed. Therefore, spotters help reduce false alarms. Spotters confirm conditions on the ground, something the radar cannot see. Choosing to activate one's self during a weather event really does help the National Weather Service issue or not issue appropriate warnings and advisories which better serves the public. What is NOT a part of being a spotter? No one will ever tell you where to go spotting nor will we force you to activate as a spotter. You might be called and asked for information from time to time given your location. However, you are always in control of your own safety and whether or not you choose to be active. Being a spotter means not taking unnecessary risks. Safe practices are always encouraged as a spotter. Therefore, being a spotter is NOT the same as being a storm chaser. We owe a great deal of credit to storm chasers for supplying footage for spotters to learn as well as those storm chasers providing critical reports too. Do not ever think that it is so important for you to get a report to the National Weather Service that you put yourself in danger! Chances are, there are other spotters nearby and, if not, they still have the use of radar to help in decision making. No report is worth getting hurt or killed over. Who can be a spotter? Most people can be Skywarn spotters. If you are age 14 and older, you are eligible to be a Skywarn spotter. You don't need to have any special skills or training. You do have to be able to demonstrate the ability to think clearly and make good decisions at a basic level though. You will be taught everything else you will need to know to get started as a spotter. We will teach you basic safety, how thunderstorms work, what kind of thunderstorms there are, and who, what, when, where, why, and how to report. These tools will be given to you in a class which you must attend at least every two years to stay current. Where do I go to get trained and certified? There are a few resources in the greater Twin Cities area when it comes to being trained and certified as a spotter. If you are living outside this area and are interested in becoming a spotter, contact your local National Weather Service office for information. 1. The National Weather Service (NWS). The NWS hosts classes throughout their weather forecast office area each spring and early summer. These classes will certify you to report to the NWS directly only. 2. Metro Skywarn. Metro Skywarn also holds classes in the seven county Twin Cities metro area each spring. These classes will certify you to report to the NWS directly and/or through the Metro Skywarn Ham radio network when a net is active. 3. Other various county Skywarn programs. Some geographic areas have created their own Skywarn programs. You can see the links below for their information. All classes are taught by either National Weather Service employees or instructors taught by the National Weather Service. Children younger than 14 years old are welcome to attend the trainings (for most of these) and learn but cannot be certified to report. There is a special opportunity in Scott County for residents who are at least 18 years of age living in the county that are more serious about their committment to being a spotter. You can always be a spotter living in Scott County via one of the other two methods listed above but if you want to take on a more serious role in weather spotting that reports through the Scott County Emergency Management avenues, SAFCOM is for you. They have a few stricter requirements but it also comes with more responsibility and, contrary to the NWS or Metro Skywarn, they may ask you to report to a specific location. More information on the program can be found in the links below. If you have a local Skywarn group/club and would like it added to this page please contact me with the link.